This 2-disk set is not at all what I was expecting or hoping for. 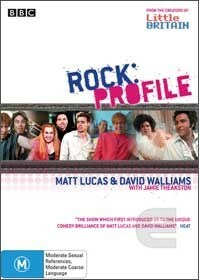 It is in fact a short comedy show written & Produced by, and starring Matt Lucas and David Walliams, who in 1999 and 2000 were responsible for two series of a television comedy called "Rock Profle" for British television. Each show, one or both would impersonate a famous musician being interviewed by Jamie Theakston. That's right each show would basically be a single sketch. Actually, the word "famous" is a little misleading; while many of them are well-known here. some are complete unknowns to me. The 2-DVD set has all of series one on the first disk and all of series 2 on the second. Which tells you that each show is not very long - a little over 10 minutes, in fact. Among the many acts lampooned that we have actually heard of are George Michael/Wham, Steps, Michael Jackson, Simon & Garfunkel, Eurythmics, Prince, Oasis, Tom Jones and Shirley Bassey, Elton John, Duran Duran, Abba, and the Bee Gees. Picture and sound quality was reasonable, if not spectacular. I have to make special mention of the menu system, which comes up when you first insert the disk. When it looks like you are turning subtitles off, you are turning them on. Not all of the episodes can actually be reached by the menu (despite the menu claiming to have them), though that may have been a problem with the review copy. Extras on disk 1 consist of a special lampooning charity collection music videos and supplementary written humour about the featured artists, mostly one-liners. There are rather more on disk 2 but these proved simply to be more of the same on other TV shows by the same duo. And more written humour, still calling themselves "facts". It's possible I was not the best person to write this review as I find most, if not all, sketch comedy about as funny as an anti-smoking commercial. On the other hand, I can clearly see that this show would appeal to fans of The Wedge, possibly Comedy Company, etc. If that sort of show floats your boat, this might be worth a look. But if you aren't a died-in-the-wool fanatic for sketch comedy, give this a miss.